Before I get into the actual review, the reader needs to understand my Paw Rating for amusement and theme park rides. The number of "paws" is not limited to just one aspect of a ride. It is not just the speed, the thrill, the type of ride, etc, that gives a particular ride it's rating. It is the overall enjoyment of the ride for what it is. The overall themeing, how well it delivers based on the kind of ride it is, etc, is what delivers the paw rating. Anyway, the themed area of "Asia" in Animal Kingdom is impressive. It is clear that the Imagineers have done their homework here. The detail is overwhelming, and if it wasn't for the steaming 93 degree weather, you would think that you were right in Nepal. As Rex would say "its a steamer." The queue for Expedition Everest is also impressive. 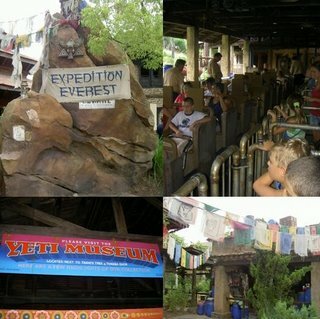 Photos and details of past expeditions, along with plenty of warnings to respect the legend of the Yeti are plastered throughout the line. Those of you who follow The Beast's Lair know that I follow the real expeditions on Everest in March, so this was right up my alley. The line moved steadily and it wasn't long before we were getting into the train. From that point, the ride takes a little jaunt before climbing the incline which takes you through a neat little building where a tribute to the Yeti is looming over you. From there, the ride goes downhill, both literally and figuratively. There is basically one well done part, where your train does a backward thrust that takes you through total darkness, and it really gets your stomach. But other than that, the Yeti is never really seen until the very end, where you kind of ask yourself, "did we just past the Yeti?" There are just not enough "twists" in the ride. For all the detail the Imagineers put into the queue and the area, the ride itself comes up simple and short. Theme park enthusiasts have been asking the question, which is better, Everest or The Mummy at Universal. For my taste, The Mummy delivers more in the way of developing the theme in the ride, unexpected turns and downright thrill. Expedition Everest is a fun ride to be sure, but not what it could or should be. The Beast Paw Rating: 2 1/2 Paws. I echo the Beast's comments, Everest is a fun ride, but does not quite live up to its potential. The backward drop is great, something I wish the Mummy at Universal had, but other than that I think the Mummy wins the battle. This site is one of the best I have ever seen, wish I had one like this. Your are Nice. And so is your site! Maybe you need some more pictures. Will return in the near future. About Me: Philip, Andi, and Callie Grace.